And now for the main event of your Vegan Christmas Dinner. Just because it’s vegan it doesn’t mean it doesn’t taste amazing! This Stuffed Seitan Roast really brings all the other elements of this dinner together. Serve alongside Perfect Roasties, Sage Onion and Apricot Stuffing, Minted Apple Sauce, Red Wine Onion Gravy and mountains of lightly steamed and roasted vegetables. All the classics such as roasted parsnips, mashed sweet potatoes, braised cabbage, burnt broccoli, Brussel sprouts, roasted carrots etc. But don’t forget to save room for the Apple Crumble, or whatever other delicious vegan Christmas desserts you have waiting! Note: This roast can be made in the morning and left to cool before things get too hectic. Then just slice off the portions you need for dinner and reheat for 10 minutes until hot all the way through just before serving. This way it free’s up space in the oven and preparing the dinner can be more relaxed and less overwhelming! Have an awesome Christmas everyone, I hope you try out a few of these recipes! Mix together the vital wheat gluten flour, nutritional yeast, pepper and paprika in a bowl. In a separate bowl whisk together the vegetable stock, mustard and soy sauce the add to the dry ingredients. 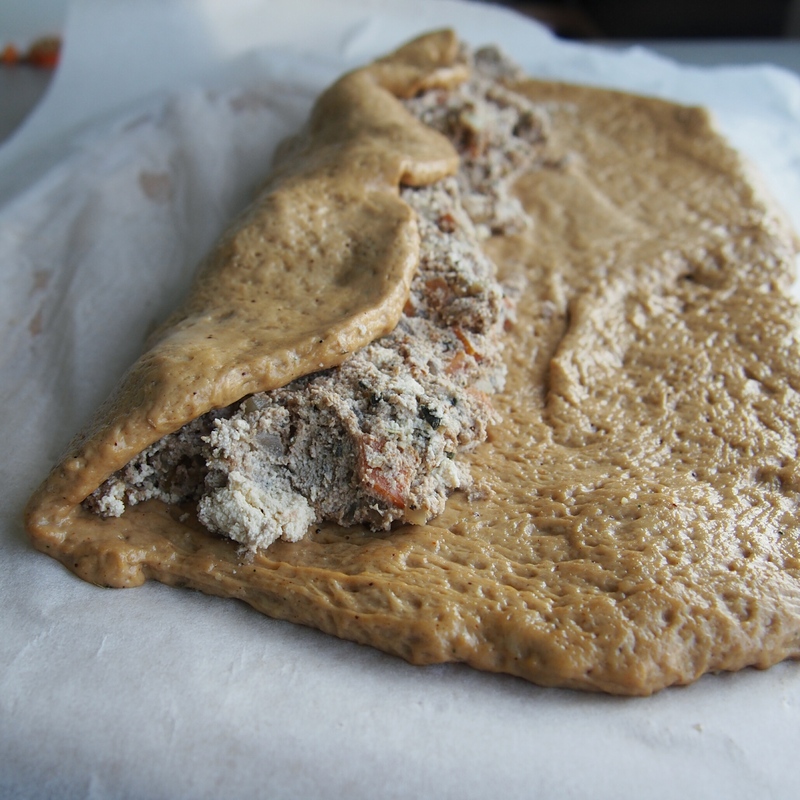 Mix together with your hands to form the seitan dough and knead for 4 minutes. 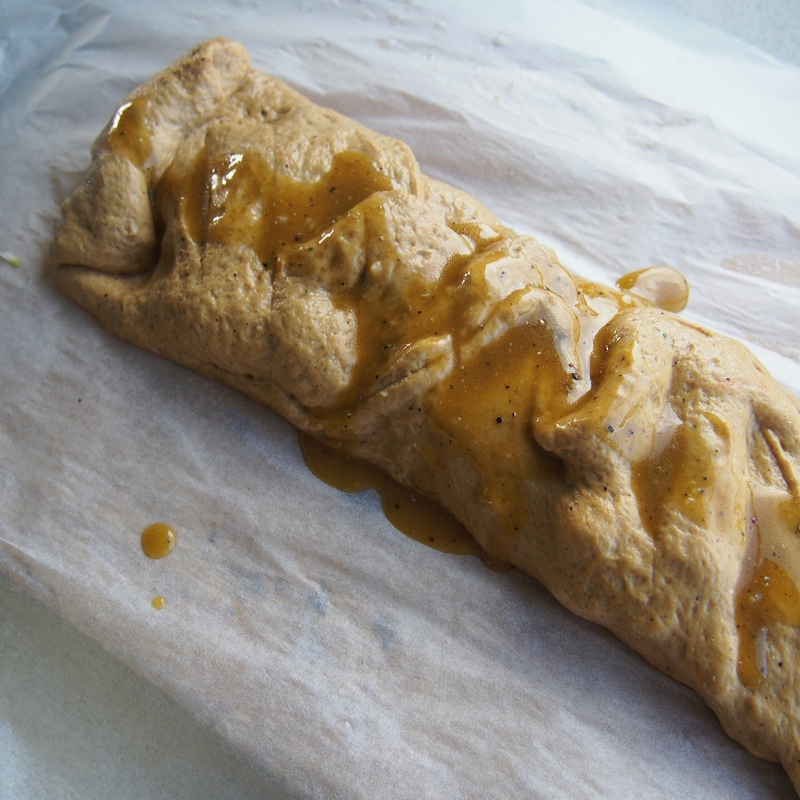 Roll out dough to a 10 x 8 inch rectangle on top of a sheet of greaseproof paper. Lightly grease the top and place either a flat baking sheet or chopping board on top and place saucepan on top to weigh it down. Leave dough to flatten while you prepare the stuffing. Heat olive oil in a nonstick frying pan and add the diced onion, garlic, carrot and celery. Cook for about 5 minutes until softened. 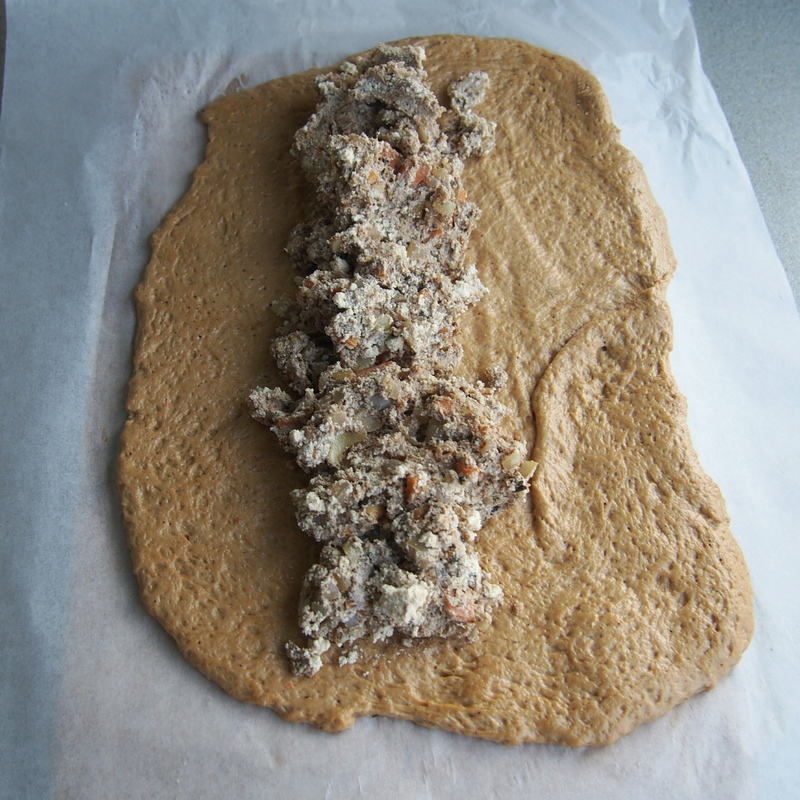 Take the chopping board/baking tray off the top of the seitan dough and place the stuffing mix along the center, long ways. Pull up the sides of the dough and fold over the stuffing until all the stiffing is enclosed inside the dough (see photos for reference). Whisk up the glaze ingredients. Make a few slices across the top then brush half of the glaze across the top. 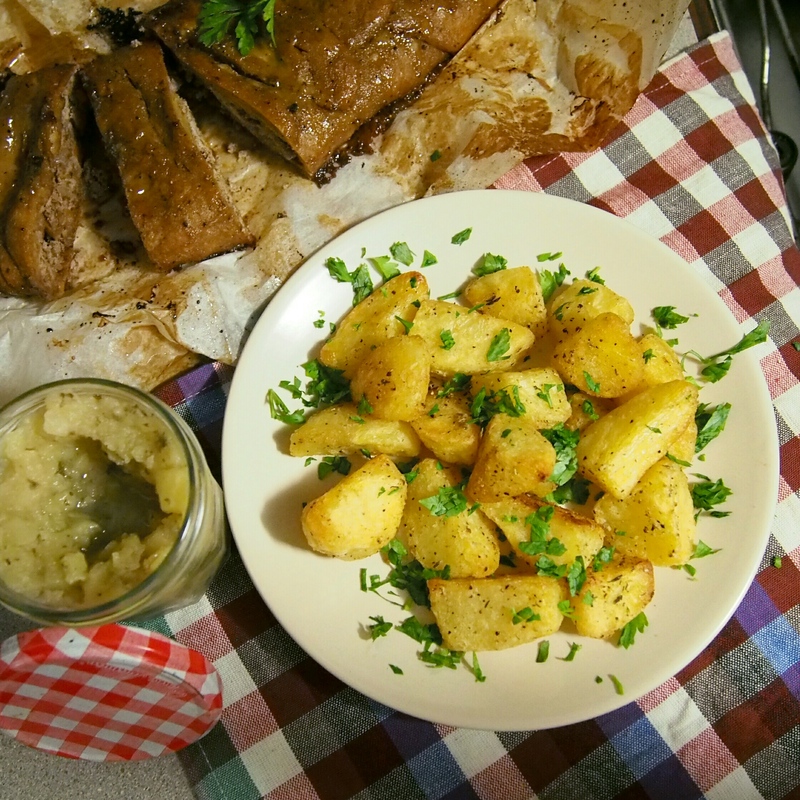 Cover loosely with the greaseproof paper, place in a baking tray and roast for 30 minutes. Remove and brush on remaining glaze and return to oven for another 30 minutes until golden. 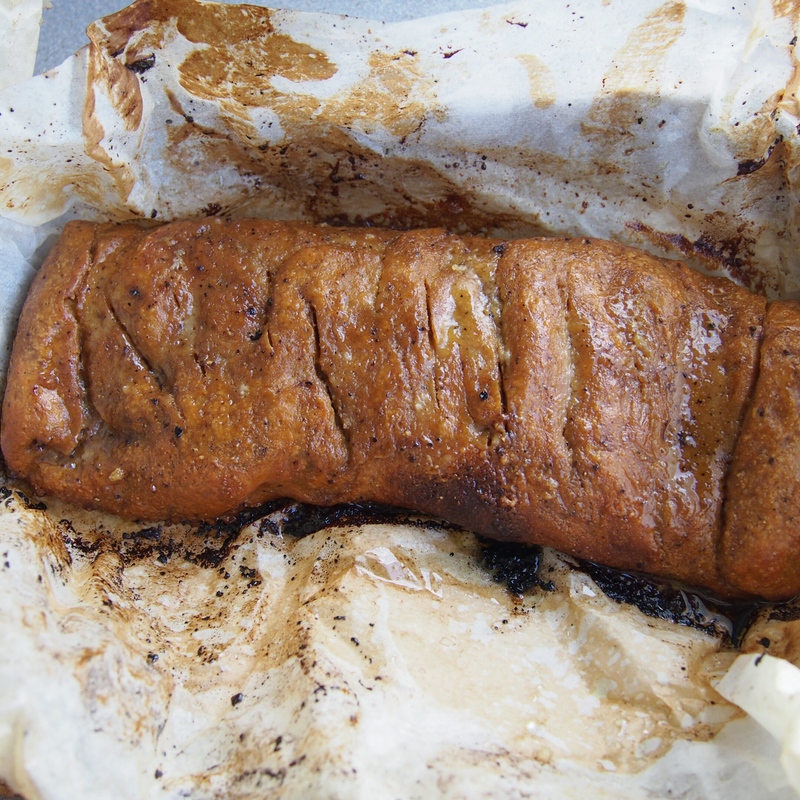 Remove from the oven and let the seitan roast sit for 5 minutes before slicing and serving.